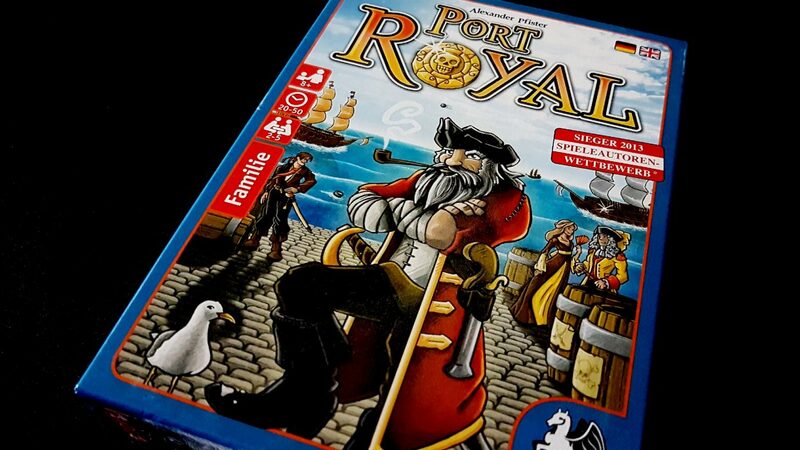 Fast, frantic and a lot of fun for a while – Port Royal got three stars in our review. While it lacks the depth of many other games of the same style, it does offer its own distinctive blend of push your luck, set collection and tableau building. Our review though – well, it hardly matters. You’re all whip-smart people capable of making up your own mind. You don’t need me to tell you what games you should buy. I’m not your dad. There are many people out there that will tell you that Port Royal is great if you want a more enthusiastic take on the topic. You can go read other blogs. It’s fine. Go ahead and leave me. I’m not crying, you’re crying. What I really want to provide is a map to the buried accessibility within the box. Wipe the poopdeck and give the mizzenmast a damn good flogging because we set sail at sunrise. The majority of the time this becomes an issue is when drawing cards into the harbour, and as such an instant judgement on colour isn’t necessary – you have time to consider what you’ve drawn versus what’s already out there. 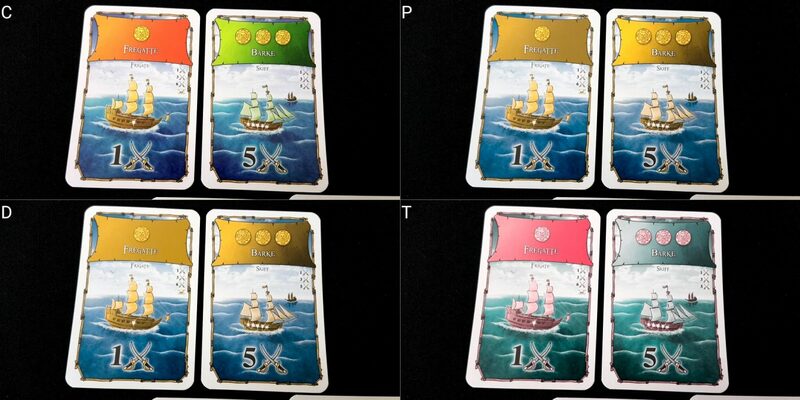 The colour of ships is also associated with individual traders, each of whom gives a cash bonus for the player that picks up ships of the appropriate type. Here, there’s slightly more of an issue because while the colour is accompanied by the name of the vessel the text is small enough to be inconvenient to read. Contrast on these also isn’t great but no information is actually lost. As such, it impacts a little on game flow but not on the feasibility of play. We’ll strongly recommend Port Royal in this category. The harbour can become full of cards as time goes by and this can lend an escalating inaccessibility when it comes to visually parsing the offering. It’s going to be made up of numerous citizen cards, each of which adopts a very similar colour palette for the aesthetic. They all have predominantly brown/grey/beige backgrounds to the images, and a blue strip along the bottom. There’s an easy accessibility win here that would go along with offering colour coded functionality there, but it’s not adopted in the version I have. The offering is also going to be made up of numerous expedition cards, which differ only in the icons along the bottom. Ships are easier to differentiate because they have a completely different layout, and the brightly bannered colour along the top can be picked out at a distance. Generally, cards are well contrasted with clear icons along the top that indicate their effect. The cost is prominently displayed in a consistent location as is the victory point value of each citizen. The version I have shows both English and German text on the cards but the English version of the text is notably less readable than the German. Realistically though it’s not necessary to be able to read this for anything other than thematic flavour, and that’s a thin soup at best. 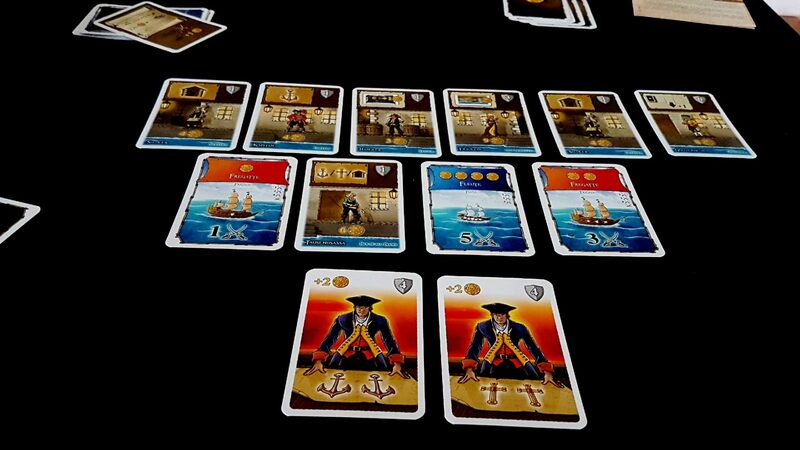 The special citizen cards are a similar style and layout but in terms of iconography the Admiral and the Governor overlap considerably. Close inspection will reveal which is which especially since the character depicted in the centre is different. If a player is stacking cards with only the top strips shown (as is commonly the case in games like this) it might cause some minor inconvenience. Currency at least is pleasingly tactile since it’s made up of a deck of cards – just the number of cards in the deck is enough to determine how much money a player has. Unfortunately though that’s where the accessibility for those with total blindness ends. 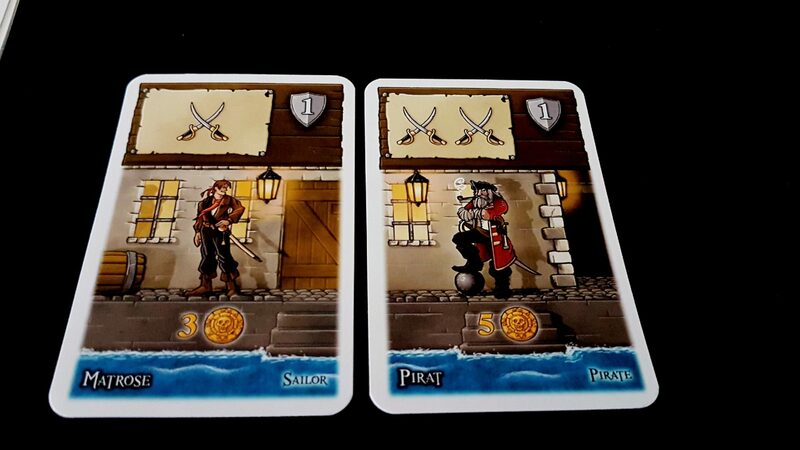 Port Royal is a card game throughout, and there are no tactile identifiers other than money that would permit someone to play the game without considerable support from the table. Beyond that the largest issue is in the central offer – if someone has been pushing their luck this might take up two, or even three, generous rows. Knowing the value of each card is dependent on the tableaus everyone is building. That tends to be a deal breaker in this section, but here it’s a little more nuanced because the tableaus players build are relatively simple. There aren’t any complex synergies or the like to visually determine – for the most part it’s a numerical exercise of optimisation. As such, you can know all you need to know of an opponent without needing to closely observe what they’re doing. It’s all open information too so you can query without game impact. Similarly when tracking your own progress – you really just need to know a few things because in the end there are only five special roles (trader, governor, admiral, jester and mademoiselle) and the rest are different kinds of currency you spend (or not) on different tasks. We’ll tentatively recommend Port Royal in this category. Draw as many cards as you like, until you stop or go bust. On everyone else’s turn, you can choose to buy a card, and if you do you pay a coin to the active player. That’s about all you need to learn in order to play. However, that doesn’t necessarily mean we don’t have any worry areas here. First of all, cards serve multiple purposes – they’re both currency and entries into your tableau. This is likely not going to be a serious worry for many players, but while multi-role components are often great for game design, they do introduce a contextual complexity into cognitive calculation. Second, the game requires a considerable degree of fluid numeracy although it’s mostly constrained to counting, addition and comparison. It comes in constantly throughout play though. You need it when buying cards (because you need to count up how many cards you need to spend, taking into account hiring discounts) and when trading ships (because you convert one ship into multiple cards, taking into account trader bonuses). You use comparison when working out if you want to repel a ship (counting up swords, comparing against the number of swords required). You use comparison when dealing with the jester and the admiral, and also when spending human resources on expeditions. None of the calculations required are difficult, but fluency in this will be needed if the game is to play smoothly. You will though need to be able to assess the chance certain cards will be drawn based on the composition of tableaus around the table, but the composition of the deck is public knowledge provided in the manual. 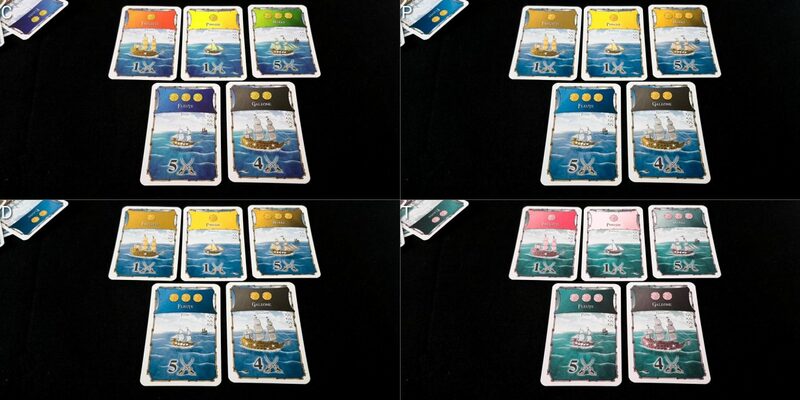 It would have been nice though to see it printed onto the cards in the same way as is done for the ships. 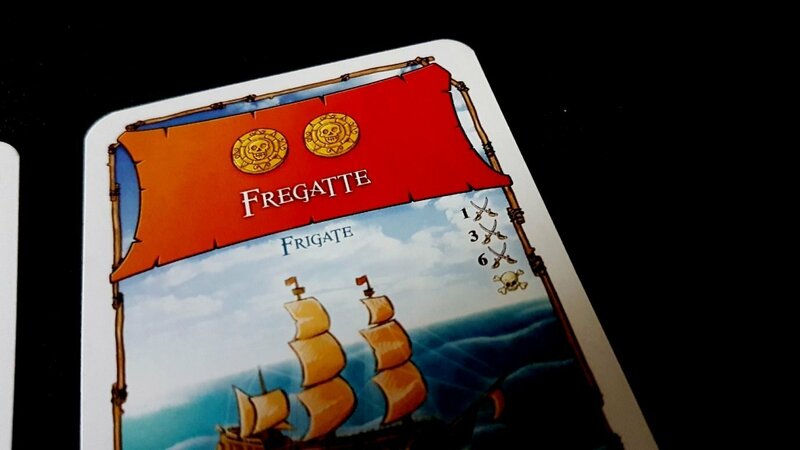 How many cards you can buy, which in turn is dependent on how many ships are in the harbour. How many cards everyone else can buy, and how many coins they get or spend, which is dependent on special characters. It’s not the wildly swinging oscillation of something like Star Fluxx or the precise interlocking of capability you’ll see in San Juan. There are though a number of moving parts that will take time, and cognitive capacity, to internalise. Synergy of cards is limited, although there are a few occasions where it might become an issue. For example, if you can buy two cards in your turn you might buy the Jester as the last available one, and then get the Jester bonus right away. Or you might buy a trader to instantly get yourself a bonus on a ship in the harbour. Again It’s not like San Juan where specialists can be carefully orchestrated to powerful, compounding effect. It’s a much lighter form of tableau building than that. Overall, we’ll tentatively recommend Port Royal in the fluid intelligence category, and recommend it in the memory category. There aren’t a lot of trouble areas here, although there are some. First of all, it can be frustrating to see a card you desperately needed either maliciously purchased from under you or discarded as part of someone else pushing their luck too far. It’s hard enough to have lost out on a key opportunity because of your own hubris – it can be galling to miss out because of someone else’s. It can be especially galling to see it happen willfully as someone essentially burns down the harbour to deny everyone else the cards they can see. Port Royal permits, and even subtly incentivises, players ganging up to take down a particular player. What you need for expeditions and victory is open information, and unless you’re in a two player game your opponents will collectively have more purchasing power than you do as an individual. Score disparities tend not to be particularly high, but the reason for that is why I say ‘subtly incentivises’ above. 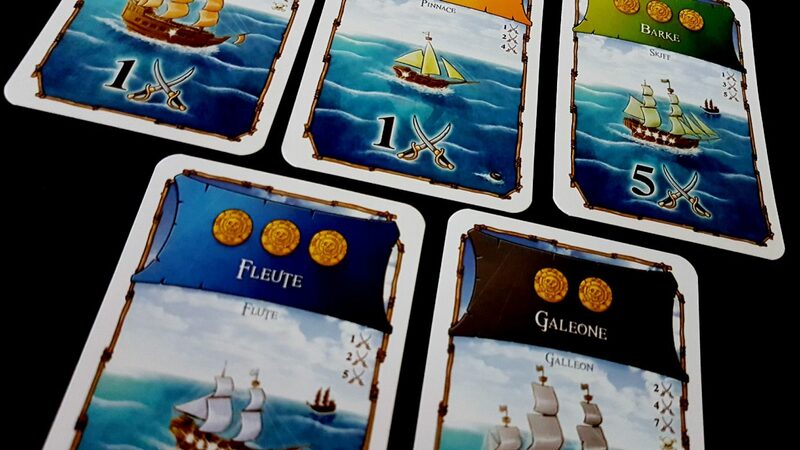 Almost every card you buy in Port Royal moves you towards victory. eEven the high scoring expeditions are less lucrative than they might seem because you have to ‘cash in’ other victory points to get them. To gain access to the low level expeditions you need to spend two citizens, and they’ll be worth two victory points on their own. You essentially double your points by doing this, but it often would have been just as effective buying a few cheap citizens. The result is that when people move to explicitly block you it doesn’t come at much of a cost to their own progress. Someone might buy the priest to stop you completing your expedition, but it still got them a point nonetheless. They didn’t have to choose between making progress and blocking yours – they got to do both at the same time. These aren’t trivial issues, but they are group dependent. Whether they are going to matter to your experience depends on how ruthlessly people will be playing. As such, we’ll recommend Port Royal here but it’s your social context that should be the real guide. Physical accessibility requirements are not especially high. There are no hidden hands in the sense we normally discuss them – coins are supposed to be kept secret from everyone, not just ‘everyone else’. All that matters in terms of money is the number of cards you have. The cards you purchase are open knowledge, and are played in an open tableau. The only physical interactions are drawing cards, picking up cards, discarding them, and shuffling when the deck runs out. Shuffling is done with a large deck of 120 cards so it’s not the easiest task in the world. It is though done only occasionally because it takes a while to work through a deck that size. If direct manipulation of cards is going to be a problem, verbalisation is a feasible solution. While there are variations of cards to be found (some cards have higher costs than others of the same type) there is an unambiguous way to refer to each. ‘The three victory point pirate’ or ‘the two victory point admiral’, as examples. Verbal instruction too will be limited because you don’t make a lot of decisions most of the time. It’s just ‘draw’ and ‘buy’ and occasionally ‘exchange’. We strongly recommend Port Royal in this category. There is no explicit need for communication, or even literacy. While cards come with descriptive text (in two languages) you don’t need to actually use any of it because it is the symbolic language of the game that conveys key information. The manual defaults to ‘he’ throughout, which is always disappointing, and the roster of characters is heavily skewed towards male. Women are shown as settlers, mademoiselles, or the ‘jack of all trades’. Everyone else is a man. That means out of a character card roster of sixty six cards, 18% of them show women. The box art too shows only a woman in the background of the scene. I’m also not entirely sure, thematically, what the mademoiselle is supposed to be doing. She reduces the hire cost of characters by one – why? Is she… is she supposed to be one of the ‘perks’ of employment for the others? Obviously the theme on Port Royal is paper thin, but what exactly is her role? It’s troubling whatever it might be. Let’s leave that aside though, and not just because it leads to some unsettling implications that are not really supported in the game. Port Royal has an RRP of around £10 and is often seen discounted even farther than that. For that price, you get a game that supports five players out of the box. While I doubt it has the longevity of something like San Juan or Race for the Galaxy it’s hard to deny it represents an outstanding investment if looking at the pure economics of it. There is a genuinely good game in here, and it’s available at a bargain basement price. We’ll recommend Port Royal in this category. Verbalisation will be impacted if physical impairment is linked to a communication impairment, but that’s a common refrain by this point. The amount of communication you do though is limited and can almost certainly be accommodated by some kind of communicative regime, even including simple blinks. If colour blindness is paired to another visual impairment, then we’d be inclined to harden our grade in both categories. While the ships remain distinctive, the trader text is very small and is best viewed with colour as an additional channel of information. Our C in the visual accessibility category would become a D instead. Due to the nature of the draw system, there can be a considerable amounst of down-time in larger games. 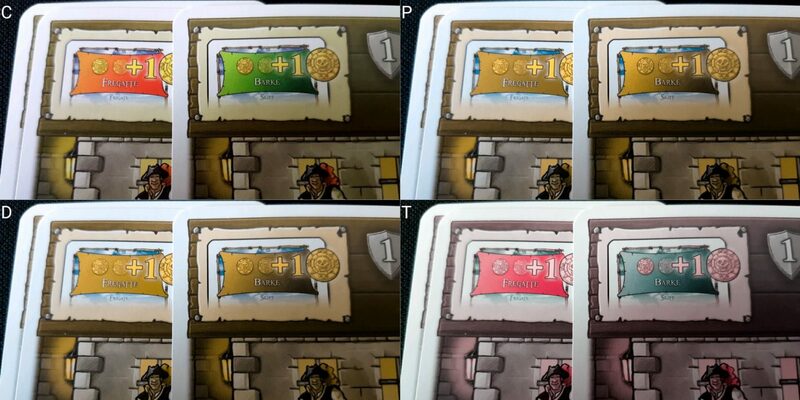 If you consider the act of drawing a card to be one of the physical draw, followed by an evaluation of each card against each card each tableau you get a fair idea of the amount of consideration some players might invest. If you then multiply that by the additional time needed for a player to draw until they are satisfied with the offer, you have a good grasp of what a turn might involve. The more players you have, the more that’s going to be a problem. The trade phase though does ensure everyone is involved a little in each turn, but perhaps not enough to keep everyone focused during what might be a 60 minute game at the high end. That’s going to be a problem for intersections between cognitive and emotional impairment. Turn time is highly variable too – in a two player setup you’ll likely get through a game in twenty or so minutes. As such, it may or may not exacerbate issues of discomfort depending on how many people are actively engaged in play. Dropping out need not be a major problem, although some redistribution of expeditions and accumulated resources may be necessary for the sake of fairness. There are no categories in which Port Royal fails to generate at least a tentative recommendation, and some of those recommendations are fairly full throated. It’s an affordable little game that we expect almost anyone to be able to play if they want. However, there are a few accessibility stumbles that deprive it of a higher ranking, and a few missed opportunities that shave a little off our enthusiasm. Many of these would be ‘nice to have’ as opposed to it being a problem that they’re missing. Accessibility though is in many cases made up of a series of things that seem, on the surface, to be merely nice to have. The impact of small things like this rapidly mounts up. At three stars, we liked Port Royal but not enough to stick with it for the long term. It’s fun when you’re playing, and forgettable when you’re not. However, accessibility has a force of recommendation all of its own. At this price, for this player count, for this accessibility profile – well, you might want to take a punt just on the off-chance you’ve found an unexpected forever game.